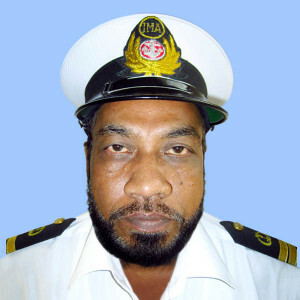 H. Sub.Llieutenant MD, ABDUL AZIZ BN (Retd) completed 34 years service in Bangladesh Navy. During his service he served as a Parade Training and Discipline Instructor of cadets in Bangladesh Naval Academy & Bangladesh Military Academy. He was also a Parade Training and Discipline Chief Instructor in New Entry Sailors in BNS TITUMIR for 10 years. He served 09 years Sea Service in various Ships of Bangladesh Navy. He also appointed as Regulating officer, Divisional officer, Security officer, Canteen Supervising officer, Maintenance officer, Sports officer, Accounting officer and Gunnery officer in various Ships and Establishments. During his naval service he visited Kingdom of Saudi Arabia, England, Egypt, Sri Lanka, Malaysia, Morocco and Oman. At present he is serving as a Cadets Discipline, Parade and PT Instructor in International Maritime Academy for last 02 years.